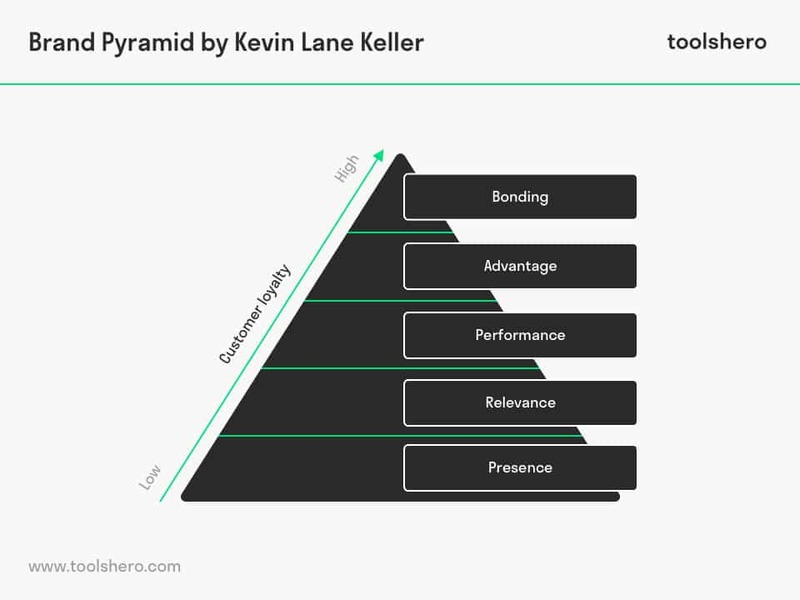 This article explains the concept of the Brand Pyramid, developed by Kevin Lane Keller in a practical way. After reading it, you will understand the basics of this useful marketing strategy tool. The Brand Pyramid aims to bind customers and ensure that they choose the same product from the same brand next time. American marketing professor Kevin Lane Keller was the first to write about the ‘brand pyramid’ in his book ‘Strategic Brand Management’, published in 1998. Additionally, famous American research and consultancy firm Millward Brown conducted research into brand recognition in the same period. This gave rise to the creation of the brand pyramid with five levels that consumers follow when they come into contact with a brand. Keller’s book is aimed at the ‘how’ and ‘why’ of brand management. Additionally, it offers guidelines for planning, measuring and managing brand value. This brand value is important for customer bonding, which will result in increased turnover. Consumers prefer to buy products of brands they know. Brand recognition is created in various ways, where advertising is one of the most powerful tools. Consumers who have a positive experience with a product of a specific brand are also more likely to make the same purchase again next time. The Brand Pyramid is a useful tool in creating a set-up for companies’ marketing strategy. It should be the primary goal of every commercial company to acquire customers on the highest level of the Brand Pyramid and, in doing so, to create maximum loyalty. The Brand Pyramid helps companies to better identify what their customers’ position is regarding their product and brand, and to investigate how loyal they are. The higher they climb the pyramid, the more loyal they are. In practice, this means that the loyal customer will first buy the product he knows best in terms of quality and brand. This is irrespective of whether the same product is offered at a more advantageous price by a competitor. The emotional level of contact between companies and customers plays a large role in marketing. In case of a strong positive emotional connection with a product of a certain brand, this emotion will lead to brand loyalty. This, in turn, will encourage repeat purchases. The stronger the bond that customers feel with the brand and product, the greater the loyalty. On this level, customers are only aware of a certain brand, without ever having bought it themselves. If they have bought a product of this brand, they haven’t become emotionally attached to the product. A promotional offer was often the first time they came into contact with the brand and tried a sample. On this level, customers start to wonder whether a product of a certain brand meets their wishes and needs and whether it’s sufficiently relevant for them to buy. Both Presence and Relevance lay the basis for building awareness of the brand, product and company. There’s no emotional bond on these levels. Customers will compare prices and subsequently determine whether it’s worth the effort to buy the product of a specific brand. This is the level where customers compare the product of a specific brand to similar products of other brands. They are aware of the product and identity of the brand. Promotion has provided an important contribution to this process. Customers will now more easily associate the brand with a specific identity and recognise it based on logo, colour, slogan and other external characteristics. In this stage, it’s important to demonstrate that the brand offers higher added value to the customer than competing brands. It’s especially the so-called unique selling points that win a customer over. Customer loyalty is almost tangible on this level. Customers believe that the product of a specific brand offers an actual advantage for them. The brand will now be associated with the customers’ emotion more easily and will contribute to their identity. Customers are able to identify with the brand and communicate this to those around them. The highest peak has been reached and customers have now built a bond with the brand. They have connected to the products of a specific brand and won’t soon make the transition to a different brand. Both the price and USPs offer a significant personal contribution to what customers had in mind. Customers now have a strong emotional bond with the brand; it’s become an integral part of their self-image. Therefore, they also wants to be associated with the brand. Many clothing brands make grateful use of this, where the customers proudly wear the clothes and have connected this to their identity. These satisfied customers are happy to return to ‘their’ familiar brand. For customers, it’s important to know how the brand responds to their needs and wishes. By utilising the 4 Ps of the marketing mix (product, price, promotion, place), a company is able to bring the product and brand name to the customer’s attention. Promotion will increase product recognition and awareness. Lots of advertising helps to increase the presence of the product on the market. Good pricing increases the relevance and means that consumers will sooner decide to purchase. It’s also important where the product is available (place) and how distribution takes place. The product either is or isn’t pleasing and is relevant to the purchaser. Please note; price is very sensitive. If the price is too high, this will deter customers. If it’s too low, it may make them doubt the quality of the product. Both on the first and second level, there’s little emotional attachment to the brand. As such, the marketing mix should be even more refined, with price being one of the most important factors. The perceived value of the product and service must match the customer’s perception. Therefore, the right price is crucial to attract customers. In order to reach this stage, a company must first show that the product is better than that of competitors. The powerful use of the previously mentioned unique selling points can contribute to this. It will convince a customer that he’s making the right choice. These USPs must offer valuable advantages for the customer, which will make him choose the same brand for next purchases again. To optimise customer loyalty, it’s useful to highlight the previously mentioned USPs even more strongly and to communicate these to the customer in as many ways possible. Customers are now able to connect the product and brand to emotions and characteristics such as ‘trust’, ‘freedom’ and ‘comfort’. In doing so, the customer can more easily promote the product and brand among friends, family and colleagues. When the customer fully bonds with a brand, this bond must be maintained. Customers are able to promote the brand within their social and professional circles by word of mouth. This should be rewarded. Loyal customers must be able to lay claim to a loyalty programme, such as customer evenings, pre-sale, specific promotions for regular customers, etc. Such incentives and events will allow customers to identify with the brand even more. They will subsequently convey this enthusiasm to other customers. What do you think? Have you ever heard of the Brand Pyramid? Do you recognize the practical explanation or do you have more suggestions? What are your success factors for measuring customer loyalty?